In room 246 our class is cooperative and are looking for more challenges. Classmates are bonding and working to accomplish their goals. Sometimes there are struggles in this classroom that’s when we have to work even harder, but at the end we will reach our goals. In the third and fourth grade Lakota room we have been working on pages in our level 3 books. We are learning out greetings and family members. Evelyn B. Combellick drew us a lovely picture of Math Thilia also known as Devil’s Tower. The students learned that it is a butte above the Belle Faurche River. It stands 867 feet. It was dedared a National Monument in 1906 by President Theodore Roosevelt. Native Americans have a legend about the Devils Tower. In Mrs. Ducheneaux’s class has been working on Positive Action lessons. Using the code of conduct helps us remember to be kind, fair, honest, respectful, courteous, patient, loving, and to cooperate with others. Students made posters to decorate the hallway and act as a reminder to use these behaviors. In Ms. Becca Afraid of Hawk’s fifth grade classroom the students are learning math. Students will begin unit 6 in their math books. They will be learning how to multiply and divide by powers of 10. Converting metric units and how to use line plots to solve problems. Students are also looking forward to starting their beading project. On April 29th and 30th students in Mrs. Webb’s class will be taking their final MAPS test. Students who raise their scores in reading and math will be able to pick out a bamboozle jelly bean for Mrs. Webb to eat. Students shouted “We are going to give you the most disgusting jelly bean! We are going to give you the dead fish jelly bean!” Mrs. Webb’s husband is so confident that the students will raise their scores that he ordered 4 boxes of Bamboozle Jelly Beans! Mrs. Willison’s third grade classroom earned 175 compliments. To celebrate this success they celebrated with a sack lunch and a movie. The students earned the compliments by following the rules in the hallways, classroom, and specials. Days of perfect attendance also earned a compliment. Kaisagarr Tavai-Fiatoa, left, is the first second grade student to reach 100 AR points. 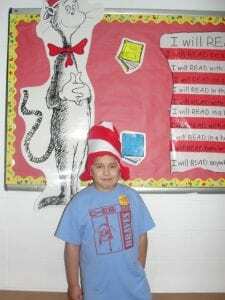 Most books at the second grade level are worth only half a point. This means he at least read 200 books. 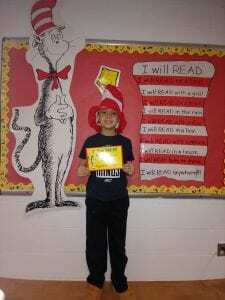 He is pictured wearing a Dr. Suess hat which he earned by reaching the 100 points.